IoT and BYOD technology are rapidly expanding the number of endpoints firms need to manage. To keep up with the explosive demand, firms are turning to centralized endpoint management for enterprises to ensure their network’s performance and security. Cisco estimates a 20 percent increase in the number of connected devices a network has to contend with each year. Gartner Inc. predicts there will be more than 20 million connected devices by 2020. With many IT teams doing 95 percent of their network configurations manually, the IoT transformation may be draining your IT team’s time and energy. Couple this with the fact that 43 percent of a typical IT team member’s time is spent troubleshooting, and you’re facing a significant impact on your company’s bottom line. It’s critical to take a close look at the challenges associated with managing thousands of endpoints and find cost-effective ways to tackle those challenges proactively. If your firm sees 1,000 customers per day, each with two or three connected devices, your team is faced with managing 2,000 to 3,000 connections per day. With each connection, your team is faced with managing potential security threats and ensuring optimal network performance. Network Performance: With the almost infinite number of endpoints, IoT can create a serious lag on your network. End users expect to be able to stream videos or download music on your network just as easily as their do on their home networks. Keeping up with these endpoints creates an increased demand on your bandwidth and traffic bottlenecks. When you meet these traffic demands, you increase customer satisfaction and minimize expensive downtime. Endpoint Security: You may also be concerned about security in the face of all these connecting devices, and rightly so. Hewlett Packard estimates that 70 percent of IoT devices are vulnerable to attack. These attacks may take the form of malware, ransomware, spear-phishing, and more. For a 2016 attack, hackers used malware that scanned IoT devices and took information from those devices to launch DDoS attacks, causing downtime for high-profile media companies such as The New York Times and Netflix. Firms focused on a secure and agile network environment are turning to an innovative solution to manage the proliferation of endpoints from one primary resource. Improve network visibility and performance: An intelligent network can detect new devices as they come online, directing traffic and preventing bottlenecks. If there’s a slowdown, your team has a 360-degree view of the issue. This allows your team members to troubleshoot issues quickly, improving your team’s efficiency and decreasing network downtime. Provide valuable data: A centralized network management tool uses predictive analytics to provide you with the data you need to make your network more effective. You can view network traffic based on location and see network issues in real time. Improve policy setting: Manually configuring policies is time-consuming for your team. With a centralized network management solution, you set up policy profiles that are applied to each device that connects to your network. You can also create virtual networks that limit the access of specific endpoints to your overall network. Improve network segmentation: You know the benefits of network segmentation. A centralized network solution can micro-segment your network so that if a bad actor attacks your network, the scope of the attack is limited and easy to identify. Few vendors provide an elegant solution for the challenges many enterprises face with managing endpoints through centralized network management. With the complexities of an enterprise network structure, that’s no surprise. Yet one provider rises to the top with resources that provide efficient and clear line of sight to even the most complicated network. Cisco’s SD-Access is an intent-based networking solution that can assist you in endpoint management for enterprises. It automates end-to-end segmentation and policy access, freeing up your IT team to focus on other business infrastructure goals. SD-Access creates a consistent user experience, improving your customer loyalty and preventing expensive downtime. SD-Access can give you the automation you need and act as a starting point into centralized network management. When SD-Access is paired with DNA Center, though, you get full visualization into your network performance. Intelligent Capture: Intelligent Capture uses radio scanning and packet capture to find wireless problems, which is a critical component of keeping IoT devices connected. Path Trace: Path Trace provides visualization of the path of a service or an application through all devices along with connectivity statistics. Device 360/Client 360: This allows you to see connectivity within your network from every angle, including information on topology and latency. Network Time Travel: One of DNA Center Assurance’s most unique tools, Network Time Travel allows your team members to view issues from up to 14 days before in a timeline. They don’t need to wait for a problem to re-occur or try to artificially recreate a problem. They can view it as it happened. Enterprises who have implemented Cisco DNA Center have seen 43 percent faster resolution of complex issues, freeing up their IT staff to focus on other business-critical goals. DNA Center also gives you the tools you need to easily set policies, including policies that limit network access. Once you create a policy, that policy is automatically implemented on the devices you specify. This allows you to easily create micro-segmented virtual networks. Virtual networks can be created with any combination of wireless, wired, or WAN deployments. DNA Center will automatically apply the policies you’ve created to your virtual network. SD-Access gives you full control over which users have access to your resources while eliminating the tedious manual time associated with segmentation. You have a more secure, better-performing network without cutting into your team’s time or your company’s bottom line. 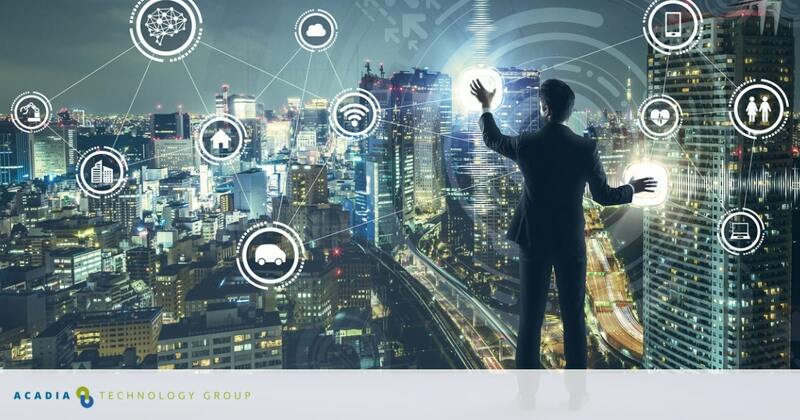 At Acadia Technology Group, we know you’re facing daunting issues when it comes to securing IoT devices and maintaining your network’s performance as well as overall network management for enterprises. We specialize in providing real-world solutions that are tailored to the needs of your firm. Our experienced staff is ready to help you prepare for the ever-increasing number of endpoints. Contact us today to find out how we can help. Join us October 25th, 2018 for a live demonstration and deep-dive of the Cisco DNA Center. Professionals from Acadia Technology Group and Cisco will walk through real-world scenarios, and explain how this technology will change the future of networking.